The November 17th meeting returns to our regular meeting room at the Fruitville Library. Meeting begins at 10:30 a. m. After a short business meeting bring your latest quilts for Show and Tell. Also we are collecting fabric at this meeting for sale at our "Airing of the Quilts" on February 2, 2019. For more information on the fabric donations see Programs. 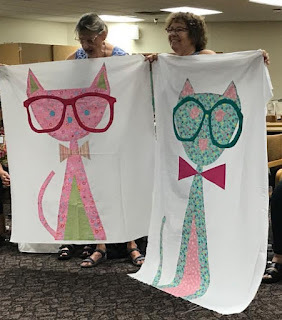 The Fat Quarter Fabric Challenge "reveal" was a big hit at the October meeting. To see the Challenge quilts see Challenges.